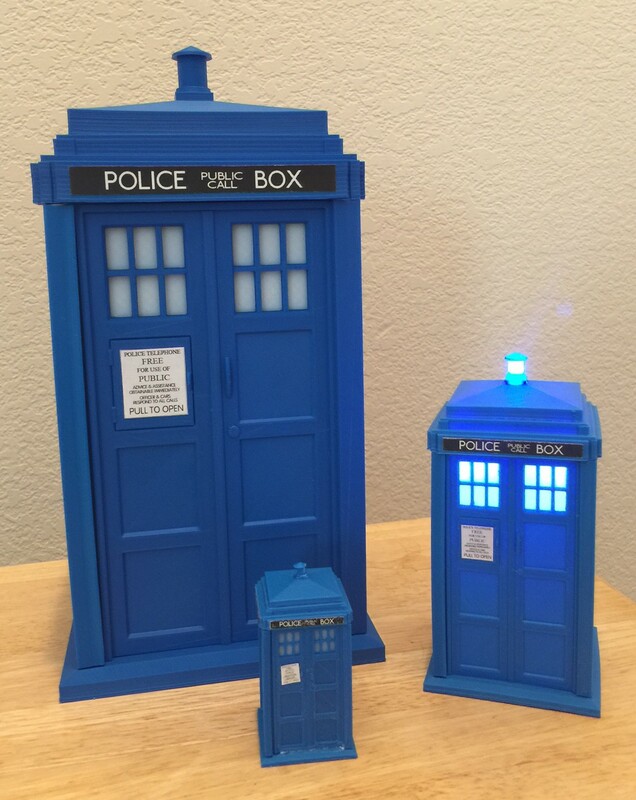 A while ago I blogged about 3D printing a Tardis. In fact, the Tardis on the right (the one that is lit up) is the one from that post. But one of the cool things about 3D printing software is that it is easy to print things at different sizes, so I figured it would be interesting to try to print out the Tardis model in different sizes. I did the little one first, and although it took a lot less time to print than the standard one (since it is only 3 inches tall) it took considerably longer to assemble. That is because of the lack of print accuracy, which is magnified greatly with smaller models. Despite the fact that you can specify the size of things in fractions of millimeters in the software, the real world factors relating to melting plastic are simply not that precise. Assembling the mini-Tardis required quite a bit of dremeling and I had to glue everything together while compressing the pieces with rubber bands. I also had to print the lamp shade a couple of percentage points smaller than the rest of the model. On the other hand, assembling the large Tardis was a dream—the pieces slid together very smoothly, since, at the larger scale, flaws in the medium become less relevant. On the other hand, it took well over 100 hours to print out all of the pieces, not including failed prints. Several pieces had to be reprinted because of jams (more of a problem with larger pieces when you leave the printer running without supervision) and also because I finished my spool of blue ABS and discovered that the replacement spool was not exactly the same shade! The only thing I had to finesse on the large model was, again, the lamp shade, which is 197% of the original, rather than 200% for the rest of the pieces. The full model is just over 12″ tall. It could probably hold an action figure of one of the Doctors, if I was into that sort of thing. My wife thinks it should be either a cookie jar or a teabag holder. I haven’t yet added lights to the large Tardis, although that is in the works. Unlike the main pieces of the model, I can’t just scale up the light and battery holders since the LEDs and battery are a fixed size, so I will need to custom-make versions of those. I’ll probably post those on Thingiverse when done. I also decided that I wanted a flashing light for the lantern. I’ve got the circuit for this on a prototype board (flashing away next to me as I type), but I need to transfer it to a proper circuit board. Once I’ve got that up and running, I will do an entry with the details.